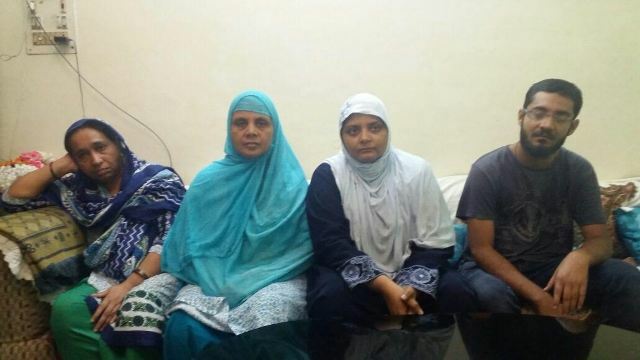 Extreme left is Nafees Fatima, mother of Najeeb, while Mujeeb Najeeb’s brother is on extreme right. Her daughter was quick to get down and hug her mother. The mother remained inconsolable. Some more members of family came out of the house and tried to console her. “Najeeb would be back soon”—they uttered. Next, some relatives–coming out of the house– hugged the women at the entrance of the house and insisted that she should enter the guest room. They again consoled her: “Najeeb would be back soon”. Eventually, she entered the guest room and sat on a sofa. Her daughter, two young girls and I also sat beside her. In the room, I could see several portraits–inscribed with the sacred verses from the Quran— hanging on the wall. Some of them read: “Allah” (God) and “Bismill?hir Ra?m?nir Rahim” (In the Name of Allah, the most Beneficent, and the Most Merciful). After a few minutes, a ten-year old girl brought a glass of water for the woman and asked her not to cry. But she refused to drink it. The woman was Fatima Nafees—Najeeb’s mother. The girl accompanying her was Sadaf Musharraf–Najeeb’s elder and only sister. Almost every day Najeeb’s mother and sister leave their house with hope but the evening ends up in despair. On Friday afternoon I had met Najeeb’s mother and sister at Delhi Police Headquarters at ITO. They had arrived there to participate in a protest demonstration. I had assembled there along with hundreds of students coming from JNU, Jamia, DU and AMU. At the site of the protest the anger was burning in the eyes of protesters. Delhi Police murdabad (Down with Delhi Police)”—the slogans rent the air for over two hours. Ever since the disappearance of the first-year Biotechnology (M.Sc) student Najeeb Ahmad from JNU, several modes of protests–holding sit-in, blockading Vice-Chancellor, marching to the Ministry of Home Affairs (MHA) and forming a human chain etc. —are being deployed almost on a daily basis against the callousness and inaction of the university administration, the police and the Hindutva-Government. 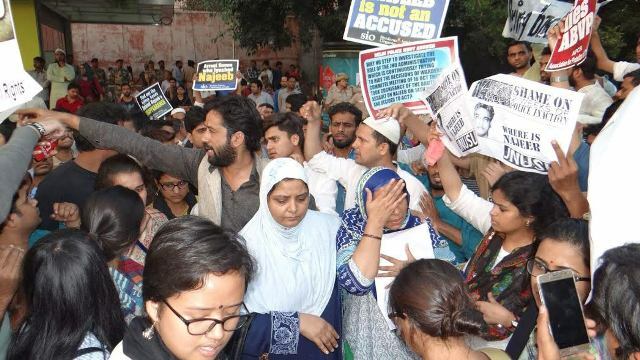 The protest at Delhi Police Headquarters was a part of the ongoing struggle for Najeeb. On every occasion, Najeeb’s mother and sister were present as a symbol of resistance. Note that Najeeb’s disappearance was first reported on October 15, following an act of brutal violence by the members of RSS-affiliated ABVP. On the previous night, dozens of students associated with ABVP had brutally beaten Najeeb in JNU’s Mahi-Mandavi Hostel. According to eyewitness the beating had left him bleeding from his mouth and nose. As dusk fell, the gathering of protesters began to thin out. Najeeb’s mother and sister were getting ready to return. Seeing them alone, I went close to them and offered my salam. They could easily recognise me as I had already met them on several occasions both inside JNU and outside. The evening was getting darker and colder. Realising it to be quite late, I mustered up courage and said to Najeeb’s mother and sister: ‘I want to spend some time with you…’ My hesitation arose from my state of dilemma I was in. I was not sure if they would be ready to talk to me at that moment. However, they willingly agreed and asked me to sit in their car. Within a few minutes the car left for Zakir Nagar. Najeeb’s sister asked me to take the front seat beside the driver while Najeeb’s mother sat in the middle row. Najeeb’s sister sat–along with her husband–in the back seat. As the car reached the circle of Connaught Place, I realised that much of the hesitation had already vanished in the air. “Much more than our close relatives, the students of JNU have shown love for Najeeb”, said Najeeb’s sister, who teaches Urdu at Hamdard in Delhi. Her appreciation of JNU students was echoed by other family members. However, Najeeb’s family was frustrated to see the insensitive attitude of JNU administration, particularly that of Vice-Chancellor Jagdish Kumar. Najeeb’s sister, whose face, neck and hair were covered with a blue hijab, expressed the glaring contrast between the attitude of the students and that of the university administration: ‘JNU ke students koi khas khana kha rahe hain jis ki wajah se unko Najeeb se itni muhabbat hai. Agar VC ko pata chale to woh inka khana band kara de (JNU students are eating some special food. Because of that they have so much love for Najeeb. If the Vice-Chancellor comes to know about this, he would stop serving them such food). Continuing her criticism of the Vice-Chancellor, Najeeb’s sister recounted the incident when she met him on October 18. The Vice-Chancellor, as she said, could only meet us after a long wait. The meeting with the Vice-Chancellor lasted for half an hour during which he did not give them any assurance. “The Vice-Chancellor did not answer any of our questions. When requested to say something, he just directed our questions to various officers of the university, who were sitting there’, rued Najeeb’s sister. The insensitive attitude of the Vice-Chancellor disturbed her and filled her heart with so much emotion (jazbat) that she addressed a gathering of hundreds of students next day at the Vice-Chancellor’s Office. Her moving speech left many in tears. All of sudden, Najeeb’s mother interrupted her. For her, the Vice-Chancellor was responsible for all this. ‘If the Vice-Chancellor wants the situation to cool down, he should give me my son back’, said Najeeb’s mother. Meanwhile, the car reached the outer-ring of Connaught Place. The focus of our conversation shifted to the role of media. Her sister is pained to see the “silence” of the media, particularly the electronic media. ‘Some newspapers are at least covering Najeeb’s case but electronic media are largely silent”, she lamented. While the disappearance of Najeeb left deep scars on his family members about JNU, the huge support shown by students for Najeeb has also made the university special for them. Recounting the love of JNU students for her family, Najeeb’s sister said that at the protest site they all stood around and gave them full protection as if “we were members of their family”. Within a few weeks, Najeeb’s sister had developed a strong affection for JNU. “Earlier we have had love for Jamia and have always felt at home on reaching Jamia area but now we have developed the same kind of affection for JNU”, said his sister. 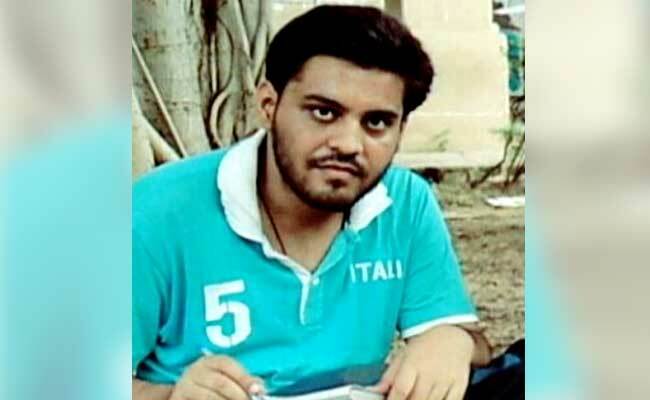 When asked about Najeeb and his study, Najeeb’s mother said that he was a studious student and had cleared entrance examinations of four prestigious universities– AMU, Hamdard, Jamia and JNU. However, he preferred JNU against her wish. Why was she unwilling to send Najeeb to JNU? She replied: “I was aware about the controversy in JNU in last February…I did not want Najeeb to go there but he did not listen to me. He became a mohra (pawn) there’, her mother cried with tears rolling down her blue and white kurta. Abhay Kumar is doing PhD at Centre for Historical Studies, Jawaharlal Nehru University, New Delhi. He may be reached at debatingissues@gmail.com.